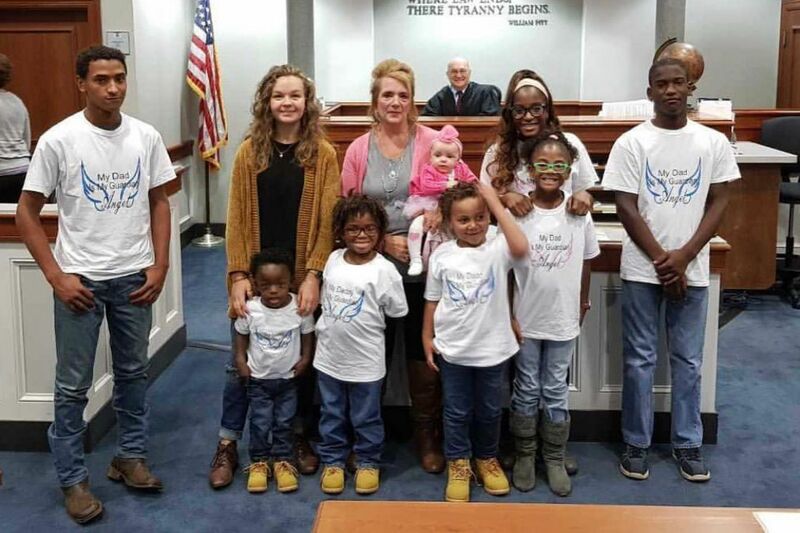 Karen with nine of her 13 children, at Olivia's adoption finalization in October: (in back, from left) Christian, Sarah, Karen holding Olivia, Jayda and Jacob; and (in front, from left): Matthew, Isaiah, Noah, and Gracie. A GENEROUS MOMENT: In September, Karen took the nine younger kids to the beach in South Carolina; when they arrived at their rental, they found a gift from the landlady: $50 to take the kids to a local ice cream shop. But when she tried to pay, the shop owner refused to take the money. That was just months before he proposed, in a car parked in his parents’ driveway, before their wedding in Karen’s childhood church in Wellsville, Pa., and their brief detour afterward to the Mechanicsburg pizza place where Keith had worked. The guys wanted to see them in their wedding clothes and present them with a free pizza. And those conversations came before the two late-term pregnancy losses — one at five months, the other at six and a half — that made Karen wonder whether they’d ever have kids. Back home in Pennsylvania, they found an obstetrician who diagnosed Karen with incompetent cervix, likely a result of medication her mother took while pregnant. The solution, if she wanted biological children: suture the cervix at 12 weeks of pregnancy, after which Karen would be on bed rest until she delivered. Pregnant once again, she learned to crochet granny squares; she worried at every twinge or ache. But after a 24-hour labor, Karen was holding Zach in her arms and sobbing. They never had trouble conceiving, but the next three pregnancies and labors all were difficult: Justin’s collarbone broke in the birth process; both he and Sarah required vacuum-assisted deliveries. They became foster parents, doing respite care for about 16 children in the first year. Then they got a call about Christian — nearly a year old, a “problem child” who compulsively pulled his hair and scratched behind his ears until they bled. It turned out the problem was not the baby but acute, untreated ear infections. “He was meant to be with us,” Karen says; the adoption was finalized when Christian was close to 3. Two years later, the couple learned that Jayda had a twin brother and an older sister; after a four-year court struggle, they adopted all three kids. In the meantime, Gracie had come to them: another medically fragile preemie, deaf from drug exposure in utero. “We saw her and thought: She’s supposed to be ours,” Karen says. After that was Noah, born full-term and drug-exposed; he was transferred from a Philadelphia hospital to one in Harrisburg until he was ready to come home at one month old. “We weren’t considering adopting again,” Karen says — until the manager of Adoptions from the Heart called, at 10 on a Friday night, and asked, “Are you guys done?" They weren’t. That baby was Isaiah, born early and with an enlarged heart, a condition resulting from his mother’s failure to take insulin for diabetes while pregnant. Matthew, next, was also medically needy: a 22-week preemie who needed heart surgery at three months. Karen and Keith had envisioned open adoptions and continuing contact with their children’s birth mothers. But that didn’t happen until Olivia, born to a young mother who wanted Karen to accompany her to doctors’ appointments and be with her at the birth. They brought Olivia home on Mother’s Day weekend. They’d exceeded Karen’s hopes by one: 13 kids, ranging in age from infancy to 33. A family that included eight African American or mixed-race children and several with serious, ongoing medical needs. Keith had been home full-time on disability since a 1999 injury. Karen home-schooled the kids, and her parents, who live next door, helped with the youngest ones. On July 21, Christian was driving to work with his dad in the passenger seat. A deer darted across the road; Christian swerved and hit a telephone pole. Keith was dead before the ambulance arrived. “It’s raw. It’s fresh. It’s heart-wrenching,” Karen says. They’d been an inseparable team, with their separate responsibilities. She could advocate ferociously for her kids with doctors or insurance companies, but she didn’t know how to clean the pool or operate the coffee maker. She misses Keith most at night, when it’s finally quiet, and on the rare occasions when she’s alone in the car. At Olivia’s adoption finalization, the baby wore a pink tutu, a matching bow, and a onesie made by a family friend after Keith died. It read, “My daddy is my guardian angel.” All the kids had T-shirts with the same message.